← Cheeky Monkey: Now you see him, now you don´t! 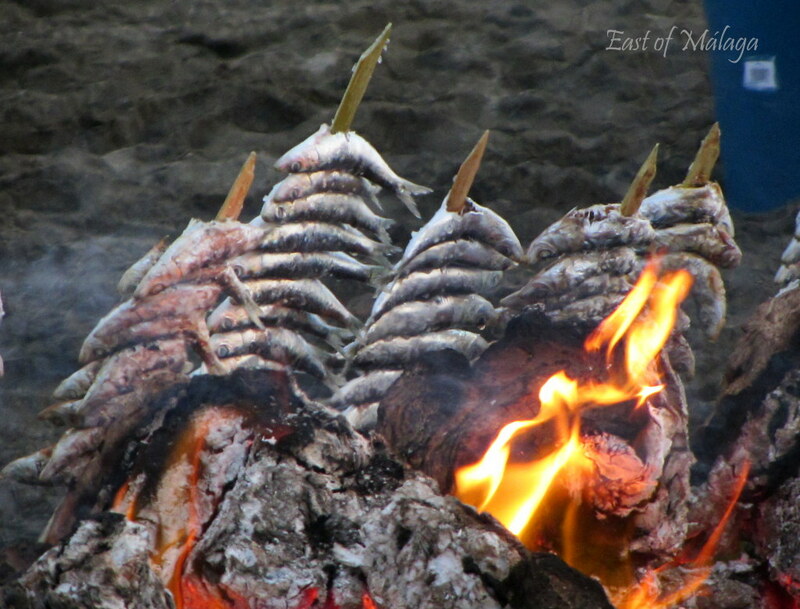 Sardines cooking over an open fire on the beach during this year´s San Juan celebration in Torre del Mar, Spain. My old camera went on the blink early last month, so I had to look for a replacement. I need a camera that is light, and easy to take with me when I´m travelling, with plenty of features, yet not too expensive. Hmmm … not too demanding, am I? I don´t profess to be anything more than an interested, amateur photographer – but I know what I like, and I keep trying to improve my images. I do enjoy taking photographs and I think that´s half the battle. Anyway, after much deliberation, I decided on the Canon PowerShot SX220HS … and I´m loving it! So, to celebrate my new camera, I have decided to change the look of my blog to showcase the photos better. What do you think? Would you let me know as I value your comments? This entry was tagged Andalucía, blogging, culture, East of Malaga, Europe, Food, photography, Spain, travel. Bookmark the permalink. Love these photos and perfect on my laptop!! Your blog and photos are great and any Canon is fab! Thanks for the comment, Gilly. The layout looks good to me! Also, nice camera pick – I had a PowerShot for five years before it got some dust on the sensor, so it was more expensive to clean than replace. But it still took great photos that rivaled much newer compact cameras. When I bought a new camera, I didn’t even think and just got another PowerShot. Play around with the settings and programs, it’s a great little camera. Thanks for the input Jess, both about the theme and the PowerShot. I´m so glad I asked people for their ideas. It´s been very useful. The blog looks terrific. I’ve been thinking of changing my blog to represent my photos better, too. I had looked at the themes: Ever After, Photography and Duotone. I still can’t decide. However, you have inspired me to try harder to make a dscision. You phot pops on first viewing. I like that very much. Good choice …..!!!!! It was a hard decision to choose for me, too. Within this theme – Nishita – there is the option of no sidebar allowing for even bigger photos,….but they were HUGE. Some people commented about that and it was also suggested to me that I look at it from a net-book or laptop rather than a desk top computer, as the screen size might make a difference to the blog’s appearance. I’ve done as suggested and decided to put the sidebar in. I still have nice big photos but the blog also looks great on my little net-book I use to travel with. I also tried the black background, but that made the text hard to read. I wish there was some font choice without having to pay to upgrade. I’m really glad I asked people to comment. Some things cropped up that I hadn’t thought of. Lovely shot! Congrats on your new camera. I’m a canon fan as well. You might have read in earlier comments, I have an old Canon EOS but it´s not digital. To be honest, it´s a bit of a lump to lug around too. This little PowerShot point-and-shoot has some great features but is small and easy to put in your pocket. Good value too! I LOVE your photos no matter what camera you use, Marianne! They are so gorgeous, they look professional. Great, lovely posts! How kind of you to say that. I am flattered, truly. I´m starting to get a little more confident now when I take photographs. I never seem to not have my camera with me. I even took some photos of my shopping trolley today when I was in the supermarket! Great Sardines pic. It’s hard to beat a PowerShot for their combination of size and picture quality. I’ve found better compact cameras, but not in such a convenient package. Hahaha … your comment made me laugh, Paula! A mouth-watering photo! Grilled sardines are one of my favourite things, something you can’t seem to get in my part of the world. I’m a Canon fan too – I’ve been using them for years. Love the new look! I agree about the sardines Sally,and here – they´re everywhere. The local fishing fleet goes out just a few miles from Torre del Mar (where I took the photo) so you can always be sure that the fish are super fresh! Great choice of theme! I use this from time to time. I can’t seem to back out. I’m getting so many likes on my current one. Nishita is a very excellent theme for pictures because it brings out a lot for every capture. Very wise. One of the main criteria for me was portability – I wanted to be able to slip the camera into my pocket or bag with ease. I am delighted with it and the results are better than I hoped for given the price of the camera. Change is good! You have inspired me…maybe I will make some changes to my blog’s appearance. These comments have spooked me a little, because for the entire time I’ve been a WordPress member, I’ve only been using a mini laptop. Only once or twice have I seen my posts on larger screens, and I have never seen how they look on a big one! From the comments above, I think I’m glad to have the sidebar to balance against the images. Like you, I like to see a good image fill up as much screen as possible. My great little panasonic/lumix camera has recently rolled over like a burro and refuses to keep the lens open. I too am in the market for a new camera but will probably stick with the lumix but with an upgrade. I am about to bite the bullet with a new computer as well, though the options are endless. new camera.. new computer.. hmm, I might as well buy some new reading glasses as well! Oh I´m happy enough with the camera. That´s great! What I´m finding some difficulty with is the new theme on WordPress! As you say, I like to have a large image on my blog, but some of them are just a tad too big for the screen. I´ll no doubt play around with the theme over the next few days. Actually, you´ve made me think, Z ….. I haven´t looked at this theme on my little travelling netbook. I´ll do that before I do anything rash! Isn´t it strange how so many electrical items seem to “roll over like a burro” all at once!? Do you think they send out death rays to one another? Your last questions made me chuckle! For me, I am positive that it’s not coincidence; at times when I’m stressed, I tend to ‘short out’ electrical things such as elevators, electric windows in cars, copy machines. Watch batteries have very short lives when strapped to my wrist. Rather than continue to replace batteries, I stopped wearing watches! Few things stress me any more, so I’m not a big threat to ‘things electrical’ any more! My camera was a good one and truly was a hard-working burro. It’s earned its time in the pasture! I took it at the end of June at the San Juan festivities, on the beach at Torre del Mar, on the south coast of Spain. There are more similar photos in the post I wrote about it here …. Thanks for taking the trouble to comment. It means a lot. I’ll be honest….I don’t really like it 😦 Right now I’m on my desktop which has a bigger monitor, although not the standard these days so the pic does not fit completely on my screen and now I have a teeny bit of a scroll. I haven’t looked on my netbook yet so not sure how that will work since that screen is even smaller? so…just my two cents. Love the pic tho!! Yes, I understand completely – and I think the same thing. The whole photo doesn´t fit on my desktop screen either. You´d think that Worpress would have thought of that, wouldn´t you? I´ll play around with it over the next few days. Thanks for your comment, Toby. It´s good to have other opinions. I’m thinking you changed something? or the look is different from my netbook? either way, I like this view!! the pictures really stand out more. they’re fabulous! Yes I did change something. I took on board what you said, looked on my own netbook to see what it looked like, and then added a sidebar making the photos slightly smaller. I think it looks great now!! Thanks for your comments, Toby. I know that you thought you were being a bit mean saying what you did, but seriously, that was the difference between me getting it right – and not. That´s exactly why I asked for people to comment. Sometimes other people think of things that you haven´t. I’m not that good at taking criticism generally. If I ask for it, no problem. it’s when I don’t ask for it that it bugs me. I’m glad I could help! Wow! I love the size and style of that camera. My Olympus PEN is a little bulky to carry around, but I do it anyway. As far as your theme, I think I like it, but on my desktop, the picture looks HUGE!! Maybe it loses some resolution. Possibly on my laptop it won’t look so big. It is fun to try to change your theme now and again; it makes you feel like you’re writing and posting all afresh! Yes, the pictures look huge on my screen too, but if I put the optional sidebar in, they look normal size again and I want to try to highlight the photographs more. It IS quite exciting to change themes from time to time, isn´t it? Thanks for your input, Cathy. Much appreciated. You’re welcome Marianne. I can’t remember the size of your photos before, but it’s nice to showcase your photos so people can really see them easily. Especially if photography is your passion! !